Transportation services are also available upon request. 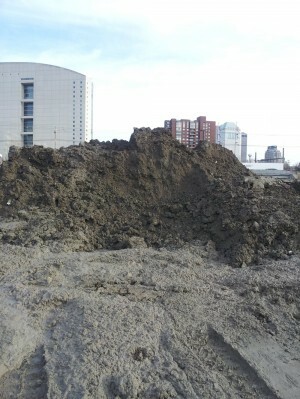 Contact us to determine whether your soil disposal project is suitable for bioremediation treatment at our facility. Under approval from the Ohio EPA, OSR accepts oil and gas exploration generated drill cuttings for bioremediation treatment and subsequent beneficial reuse disposal. OSR utilizes our unique form of bioremediation to reduce contaminants associated with naturally occurring hydrocarbons and drilling muds to levels below the applicable state and federal standards. Following remediation, the drill cuttings are beneficially re-used at OSR’s facility as the bottom layer to facilitate a cap and cover on a former landfill. Contact us for pricing and additional info on our drill cuttings disposal services. OSR provides a convenient and centrally located disposal solution for drummed soils from site assessment / investigation derived waste streams and spill clean-ups. Drummed soils are emptied on OSR’s treatment pad and processed for remediation in the same fashion as bulk soils. Emptied drums are cleaned and recycled. Pick-up and transportation services are also available upon request. Contact us to find out more about our drummed soil disposal services. OSR provides a safe and secure disposal option for materials used during emergency response activities. Absorbent pads, booms, plastic sheeting and other emergency response disposables can be delivered to OSR along with soils. Non-soil waste is bulked in lined roll-offs and stored under roof for subsequent disposal at a licensed and approved landfill. Contact us to find out more about using OSR as a one-stop disposal solution for emergency response associated soil and non-soil wastes. Contact us for additional info on backfill pricing and availability.